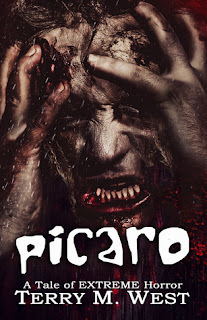 Terry M. West's Picaro is the most insidious kind of extreme horror, a story that opens on a grotesque note, but which then lulls you into a false sense of complacency before allowing all Hell to break loose. There's actually a clever bit of misdirection within it, making you think you're reading a violent crime thriller before West pulls the rug out, revealing that trap door to Hell beneath it. "I travel. I wander. I'm a sworn vagabond. Or picaro. I prefer that word. Nice ring." A grotesquely massacred pimp/lover, a vicious gang, and a charismatic stranger all add up to trouble for Binh Pham, especially when coupled with uncontrolled bouts of narcolepsy. Paul, the charismatic stranger, is a mysterious character who seems too good to be true, but we're teased with precisely what kind of threat he poses for much of the story. "You will never die. And neither will the hunger. Try not to forget your name." Even when the story finally makes its bloody descent into Hell, West raises enough doubt that we wonder what is really going on. Picaro is an effective bit of extreme horror, people by a pair of intriguing characters, and told with bloody flair.